South Florida Cities are very fond of their Entrance Features. The City of Wilton Manors had a feature that is depicted in this monument up until the thing fell down due to Neglect back in or before the early 80s. The picture you see here, er inside the picture, is a depiction of the original feature and is the same feature that is on the City Seal that sits behind the Mayor and the Commission in the chambers in the new City Hall. It is rendered in Ceramic Tile and the tiles were placed on a waist high wall by the volunteers and children of the local schools. The Post Card is the first stage of a feature that if it comes off will be quite nice for the people who come to use that little vest pocket park. It will have a bench that is made to look like interlocking hands and should grace our city for decades to come. The little Jaycee Park feature will be created in the vision of a fascinating group of people, but in particular through the energies and vision of another one of our strong and fascinating women here, Diane Cline. Diane was a former Vice Mayor, the first one when we went to the current Mayor/Commission version of government and was recently appointed Commissioner. She's President of the Historical Society, on many other boards such as Wilton Manors Main Street where I am honored to be able to see her in action. She's showing no signs of slowing down, thankfully, because this City needs her vision and energies to help guide us toward the future. Did I say I am honored to know her? I did, good, it needed to be said again. I had promised to get Diane a picture of the monument, and this one isn't quite good enough since while it looks great on my laptop, it won't print out well due to the darkness of the shot. I'll get out there before Lunch some day and retake it. 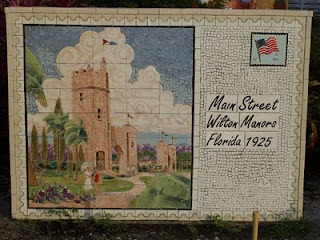 Wilton Manors is blessed by many strong women who are here to help guide us. There are many strong men who stand with them. The spirit of Volunteerism here in this City make it so very much more than the playground of bars that some think that it should be. The reputation of the City would be much less stellar if it weren't for the many Volunteers here, and the Mayor and City Commission tp complete the picture. Agree or disagree with them, people like Diane Cline are a very positive aspect of living in Wilton Manors.